Speaking at the ASEAN-China summit here, Duterte said ASEAN and China continue to affirm the importance of maintaining and promoting peace, security, stability, safety and freedom of navigation and over-flight in the South China Sea. 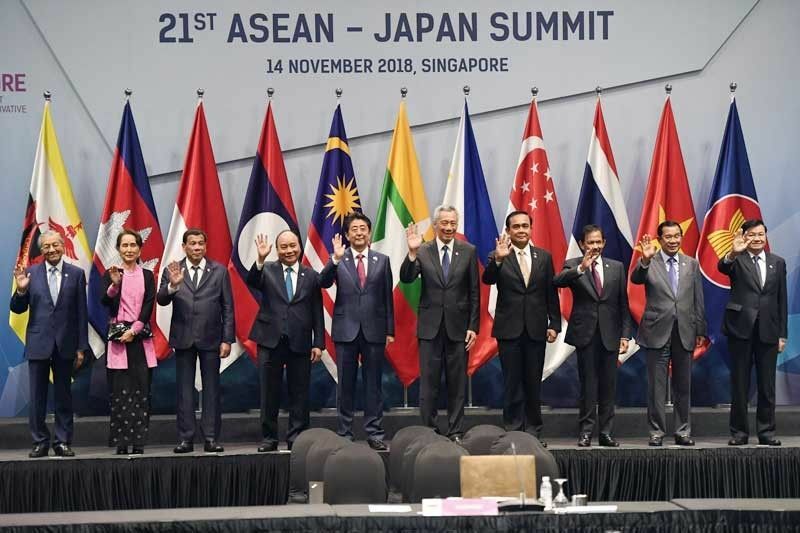 SINGAPORE – President Duterte yesterday vowed that the 10-member Association of Southeast Asian Nations (ASEAN) would reach an agreement at “all costs” on the code of conduct (COC) in the disputed South China Sea while the regional bloc continues to work on a single draft. “We reaffirm the need to enhance mutual trust and confidence, exercise self-restraint in the conduct of activities and avoid actions that may further complicate the situation and pursue peaceful resolution of disputes in accordance with international law, including the 1982 United Nations Convention on the Law of the Sea,” he said. Duterte also said ASEAN and China have made “steady progress” in the initial phase of the COC. “(We) have seen steady progress in the initial phase of the COC negotiations since the announcement of a Single Draft COC Negotiating Text and look forward to the completion of its first reading by 2019,” he said. He added that as co-chair of the COC negotiations, the Philippines would continue to work closely with the ASEAN and China for the early conclusion of an effective and substantive COC. Duterte delivered the joint statement during the ASEAN-China summit yesterday morning. Duterte also reported on the first ASEAN-China Maritime Exercise. “The exercise is a useful confidence-building measure that strengthens practical cooperation and builds mutual trust, friendship and understanding amongst ASEAN and Chinese navies,” he said. Meanwhile, in his speech, Chinese Premier Li Keqiang said Beijing and ASEAN are bound together by mutual interests but admitted there are also some differences. “We have been working to handle our differences in a proper way… we have found a way to properly manage and diffuse (these). For example, the issue of the SCS (should be resolved with the implementation of) the Declaration on the Conduct of Parties in the SCS (South China Sea),” Li said. “Overall, peace and stability in the SCS have been maintained and now the situation is toward great stability. China is ready to work with all ASEAN countries – concluding COC consultations in three-years’ time,” Li added. “It is our hope that we can set up a time frame so that in three years, the COC will become a set of rules contributing to peace and stability in the SCS, that will also be conducive to free trade and further upgrading of our free trade area,” Li said. Interviewed before the ASEAN-China summit here, Duterte noted that the friction between Western nations and China has become a concern for ASEAN. “Everything has been excellent between China and the rest of ASEAN, except for the fact that there’s friction between the Western nations and China,” he said. Although he has repeatedly admitted that Manila cannot go to war with Beijing, Duterte said he will call the attention of China on its actions in the disputed sea areas. “You know, because of the treaty I’d like to (tell) China – that is why, at all cost, we must have the COC. So you’re there, you’re in possession, you occupied it. Then tell us what route we shall take and what kind of behavior,” the Chief Executive said. Duterte also pointed to a major concern on the impact of the code on the Philippines, which has a mutual defense treaty with the US. “I am worried. I expressed it last night because we have a defense treaty – mutual defense… with the US and there’s some – a serious miscalculation,” he said without elaborating. Duterte recognized that the Philippines cannot simply put aside the treaty with the US. “It’s not abrogated. It’s there and even – I don’t know. It’s the decision of the President, Congress, the Armed Forces,” he said. For his part, Singapore Prime Minister Lee Hsien Loong stressed the importance of strengthening ties between ASEAN and China. “Our economic rules are robust and have grown from strength to strength. China has been ASEAN’s top trading partner for eight consecutive years,” Lee said. Duterte attended the ASEAN-China summit but skipped the first event of the Summit with Australian Prime Minister Scott Morrison. He was also absent at the ASEAN-Republic of Korea summit and the working lunch with ASEAN leaders because he reportedly lacked sleep. Duterte reiterated the Philippines’ commitment to the peaceful resolution of conflict among parties in the South China Sea as he pushed anew for implementation of the code of conduct. “We need to intensify cooperation and implement previously agreed-upon action plans if we are to address these issues and realize a more peaceful, stable and secure region,” Duterte said. Duterte added that the Philippines is prepared to do its part in addressing various security concerns on terrorism, violent extremism, radicalization, piracy and armed robbery at sea, trafficking of persons and illicit drugs. Since the Philippines is the country coordinator of ASEAN-China Dialogue Relations until 2021, Duterte said that the country is working for the substantial and early conclusion of an effective COC in the disputed areas in the South China Sea. Duterte also welcomed the recent developments in the Korean peninsula. “We urge concerned parties to continue working toward the realization of lasting peace and stability and reiterate our support for the complete, verifiable and irreversible denuclearization of the Peninsula,” Duterte said. Ahead of Chinese President Xi Jinping’s visit to the country on Nov. 19 and 20, former solicitor general Florin Hilbay yesterday warned the Duterte government against pursuing joint exploration with China in the West Philippine Sea. Hilbay said entering into a joint exploration agreement with Beijing is tantamount to waiving the country’s victory in the Permanent Court of Arbitration (PCA) and surrendering its ownership over the West Philippine Sea. “This could have an implication on our victory. If we enter into a joint development with China, it might give the impression that we are surrendering our right over the West Philippine Sea,” he said. Hilbay said the PCA decision states that the Philippines has sole ownership over the West Philippine Sea and entering into a joint exploration with Beijing could put the victory in peril.